A tense Friday night in Kiev for both sets of fans, both Sweden and England knew that a positive result here was vital. England had never beaten Sweden in a competitive encounter, drawing five and losing two of the seven matches, reason for Swedish fans to be optimistic despite their poor performance against Ukraine. With the start delayed by the events in Donetsk at the other group D game, as rain and thunderstorms forced the teams off the pitch for an hour, the atmosphere grew with a predominantly Swedish crowd trying to give their team their support. The pre match statistics indicated that this match would have a fair amount of goal mouth action with Sweden’s last 10 games at the European championship’s yielding an average of 2.5 goals per game. Sweden fell behind to an early goal from Andy Carroll, Sweden fought back after the half and took the lead from a Glen Johnson own goal and a headed goal from Olof Mellberg. England brought on Theo Walcott and the game changed, Walcott equalised and then provided the cross for Danny Welbeck’s winner as England took the 3 points 3-2 after 90 minutes. Sweden again started in the same formation they used against Ukraine, a 4-4-1-1, but there was three changes to the starting eleven. Granqvist moved to right back in place Mikael Lustig as Jonas Olsson came in at centre back, Rasmus Elm moved from central midfield to the left hand side in place of Ola Toivonen as Anders Svensson took a place in central midfield. Finally Johan Elmander replaced Markus Rosenberg up front with Zlatan Ibrahimovic playing just behind him, who had scored for Sweden in every one of his last 4 starts. Sweden began the match appearing to be a bit more stable at the back than they were against Ukraine in the first game, the first real chance of the match fell to England though as Isaksson was forced to make a good save from Parker 7 minutes in. While the Swedish team is one of the tallest starting eleven’s in the tournament they clearly have problems defending crosses as 9 of the last 11 goals they have conceded have come about via the aerial route. This was clearly visible in the 23rd minute of the game when Andy Carroll got in between two defenders, Granqvist and Mellberg, and rose above them to head home the cross. This weakness was clearly one that was targeted by England as they had included Carroll in the starting eleven and attempted to whip balls in when they could with an early chance falling to Welbeck as he got in front on Mellberg for a header, just as Shevchenko had the game before, fortunately for Sweden the header was off target. 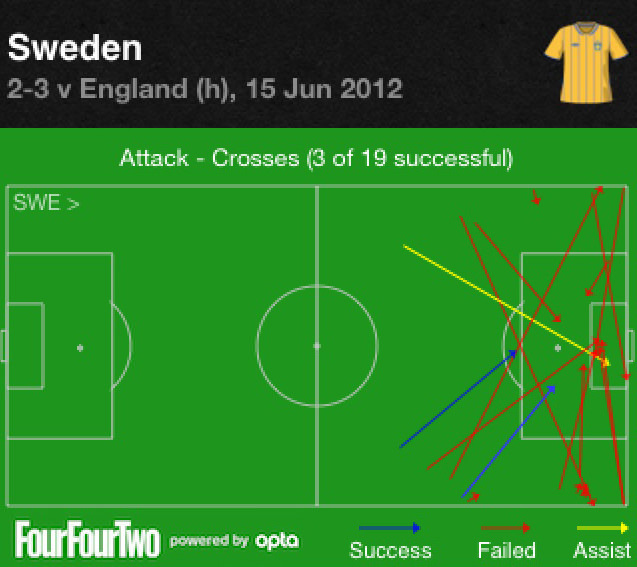 As the graphic below demonstrates England where clearly trying to attack Sweden’s aerial weakness by getting crosses into the box, completing 4 of 9 attempted crosses including the assist for the goal. The majority of the balls delivered where from the Swedish left hand side where Rasmus Elm and Martin Olsson were defending, possibly due to Elm not tracking back as much as he perhaps should have to give his left back cover. Sweden were playing better football during the first half than they did against Ukraine, as they attempted to play balls to feet instead of looking for long balls to the front men. They also attempted to use the wings more often to spread the play and create a bit more room for Zlatan Ibrahimovic in the middle of the pitch as he attempted to be a playmaker as well as look for space where he could get a shot away. Rasmus Elm and Seb Larsson where providing the team with good width and attempting to put balls into the box for Elmander or looking for the pass inside to Ibrahimovic on the edge of the box. Ibrahimovic showed no signs of the injury that kept him sidelined throughout training in the build up to the game as he comfortably out ran John Terry to a ball, while he used his excellent strength to shield the ball from defenders and to win the ball back from them high up the pitch. The change in Sweden’s approach is clearly visible in the heat chart from the first 45 minutes of the game showing where they had the possession of the ball and where they attempted to attack from (with Sweden attacking from left to right). Sweden clearly attempted to use the right-wing more this match than they did before with Seb Larsson seeing a lot more of the ball and completing a higher percentage of his passes (79%). Half time arrived and it was 1-0 to England with Sweden only having 46% possession. Sweden began the second half well pressuring England high up the pitch which led to them winning a free kick outside the area, Zlatan Ibrahimovic stood over it looking to pull Sweden back into the match. He fired the free kick straight at the wall but his follow up attempted scissors kick on the volley found its way through to Olof Mellberg who’s shot was parried by Hart into Glen Johnson and into the back of the net for what was credited as a Johnson OG. With the score line level Zlatan Ibrahimovic came to life again pressing England high up the pitch using his strength and pace to beat defenders and enabling him to make room for shots at goal. The graphic below shows that over the course of the 90 minutes, Ibrahimovic had 6 shots in total, 4 of which were on target and 1 was blocked. All but one of his shots came from outside of the box. As the second half continued, Olof Mellberg continued to make vital contributions to the team’s effort with vital tackles and interceptions stopping attacks. In the 59th minute he again appeared in the box and found himself unmarked from Larsson’s free kick which he headed into the back of the net to give Sweden the lead. Clearly Sweden’s set piece ability was being showcased as both of their goals had begun from set pieces, the aerial ability that had been so poor at defending had turned into an attacking threat. Throughout the game Isaksson had made a series of good saves, to which he added another when he saved a shot in the 63rd minute. Theo Walcott’s introduction proved the turning point in the game as Sweden’s defence failed to deal with his pace. First he scored minutes after his introduction with a shot from outside the box, defenders were too slow to close down the shot effectively and Isaksson lost the ball as it swerved straight past the helpless keeper. Sweden continued to press looking for a winning goal, but poor defending from Larsson and Martin Olsson left Walcott free to put in a dangerous ball across the face of goal that Welbeck turned in with a back heel. Sweden continued looking for an equaliser as they began to dominate possession in the last 5 minutes of the game with England being forced further and further back, but ultimately the final chance of the game fell to Jonas Olsson who headed over the bar as England took the win and the 3 points and left Sweden out of the competition with 0 points after 2 games with France left to play on Tuesday night. 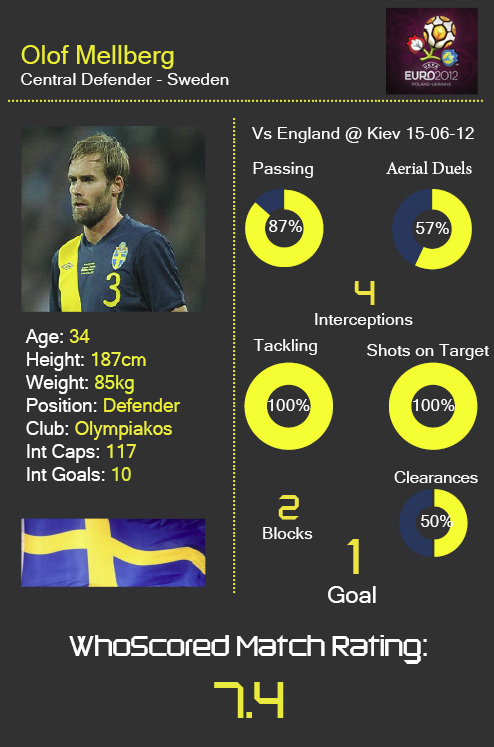 Olof Mellberg was a key figure in this match for Sweden having a hand in both goals they scored, while he also performed well at the back apart from one blip that allowed Carroll in between himself and Granqvist. Sweden played a lot better in this match than they did in the previous game against Ukraine, they kept the ball on the floor more and played passes into feet which enabled them to keep the ball more as they finished the game with 50.3% possession. They also attempted to use the wings a lot more with the right hand side in particular being a key outlet for them, as Seb Larsson had a better game than he did against Ukraine. Their use of the wings and trying to use their height as an advantage going forward is clearly shown in the graphic below as they attempted to put more balls into the box for their strikers to feed from. Clearly the right hand side was the more successful side in terms of numbers of crosses that actually fell to a Swedish player, however, a cross from the left resulted in a goal which was more vital. 2 of the 3 completed crosses were delivered early for the strikers and the cross that led to the goal was from a set piece. The graphic also displays a distinct lack of quality in the balls into the box, possibly due to the team only playing one striker with the wide men trying to find a lone player in the middle of a lot of English defenders. Completing only 16% of crosses into the box is not a good sign for an international team with a height advantage over many other teams. Sweden clearly felt that they had played too direct in the previous game and needed to use the wings more, this is demonstrated in the heat map for Swedish possession (below) as the right hand side shows a lot more activity than it did in the previous game versus Ukraine. Having Rasmus Elm on the left hand side did not seem to increase the amount that this side was used however, possibly due to Elm not being a natural left winger as he wanted to cut inside and drift into midfield. To conclude Sweden where again exposed at the back by balls crossed into the box, with some sloppy defending they couldn’t hang on to the lead for long enough to secure even a point. They showed some attacking potential going forward and gave their supporters reason to believe they can end this tournament with a win versus the French if they’re attacking players perform again. Sweden will have to work on how to defend crosses into the box however, if they want to take any points home with them as this has been a major weakness that has now been exploited by both Ukraine and England. No doubt France will also target this weakness by trying to feed balls into Benzema, although he is not the Andy Carroll target man sort of striker, as he likes to pick the ball up deeper and have shots from outside the box as he has shown throughout the tournament. Zlatan Ibrahimovic tried to create attacking movements with some success and showed little sign of injury, his play and that of a few others such as Larsson and Mellberg were bright spots in a sad night for Swedish football as they once again failed to get out of the group stages. There were two current premier league players on display for Sweden and another who was recently relegated. Seb Larsson of Sunderland had a better game than his first outing against Ukraine, he managed 1 shot which was on target, completed 79% of his passes and created 2 chances for his team mates. He also completed 50% of his crosses, and had a 100% tackle success rate. Overall good signs for things Sunderland fans should look forward to seeing next season. Jonas Olsson of West Brom got his first start of the tournament, he completed 73% of his passes, only 50% of his tackles were successful but he managed to clear the ball 7 out of 8 times. He won all 3 aerial duels and committed only 1 foul in the match. Finally the recently relegated Blackburn player Martin Olsson started again at left back, he completed 90% of his passes, with a 100% pass accuracy in the final third. He created 2 chances with good runs down the wing, but failed to complete any of his 2 crosses, he was also successful in all 3 of his attempted take ons, beating players with good skill and pace down the left hand side. He only attempted 1 tackle, which was unsuccessful, but made 4 interceptions and won his only aerial duel. Overall he showed good ability going forward but maybe needed a bit more help from the left midfielder in front of him when defending. Categories: EPL Index Featured Article, Euro 2012, and Sweden.' 'Tags: BRFC, defeat, Eliminated, England, Euro 2012, Euro 2012 Opta Stats, Euro 2012 Stats, Euro 2012 Sweden Stats, football, Gerrard, Group D, Hamren, Ibrahimovic, Isaksson, Johnson, Larsson, LFC, Mellberg, MUFC, Olsson, Opta Stats, SFC, soccer, Sweden, and wbafc.